A food ingredient made from bread that may be either a dry crumb or a fresh crumb. The dry crumb (toasted) is typically available canned in finely ground particles that are used as toppings on foods or as a coating that is applied to the food prior to cooking, or as a binding agent. Dry crumbs can be purchased or made from bread that is toasted or baked in an oven and ground into smaller bits. 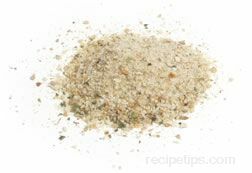 The fresh breadcrumbs (untoasted) are used on baked food dishes requiring a topping that may add substance, a crusty texture and an appeal to the appearance of the dish. The fresh crumb can be chopped or placed in a blender to provide a size and consistency that works best for the food being prepared. Japanese breadcrumbs that are made from the heart of the bread, not the crust are known as Panko. This type of breadcrumb has a coarse texture that resembles flakes in consistency, which adds more of a crunch to breaded foods such as fish, pork, casserole toppings, and a variety of fried foods. Due to the flaked crumb, the texture is often considered to be more tender and lighter, yet crunchier for longer than a typical breadcrumb coating. Panko is available in most Asian food stores. For storing all types of breadcrumbs, place fresh or dry breadcrumbs in a freezer, stored separately in airtight containers. If fine textured crumbs are too fine for the item being prepared, a coarse crumb can be created by using Italian or French bread. It is best to use "day old" bread that has dried more than fresh bread. Break off chunks of the bread (leaving the crust on any pieces with the crust) that are to be placed in a blender and ground into coarse crumbs. Remove the crumbs and if more drying is desired, place them evenly on a baking sheet and bake for 10 to 15 minutes at 300ºF, turning them periodically until they become golden brown or sufficiently dry for use. For every cup of breadcrumbs required in a recipe, use 1-1/2 cups of coarse ground fresh bread.